Housing and care for mice, rats, hamsters, guinea pigs and dogs (under special conditions only) are available. Daily monitoring of animals is provided during the course of an experiment, and campus veterinary care is readily available if needed. All animal rooms are temperature and light controlled, and cage washing and storage are available on-site. Click here for per diem rates. 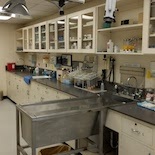 CHE clinical facilities consist of a small animal hospital, survival surgery room, surgeon's prep area, intensive care unit (ICU), pathology room, and necropsy room. Large and small stainless steel cages are available as well as water-filled and electric incubators. Special temperature and humidity controlled rooms are available for investigators conducting aquatic animal studies. The rooms are isolated to meet needed lighting and feeding conditions and can fit multiple aquariums and racks. The Seabird Room offers three fresh and saltwater pools. Each pool has an independent sand filtration system as well as a net top enclosure so that birds can be isolated. Cameras are installed over each pool, and a small separate work area is provided for personnel making behavioral observations. The room is temperature, humidity and light controlled.